2. Wisdom Important As New Residential Construction goes, so goes consumer spending. 3. Knowledge Important Housing starts need to be more than 800K per month to be considered Fair. 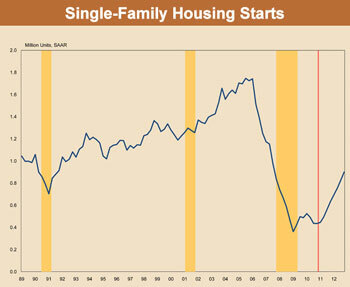 In the past 50 years, from 1957 through 2007, housing starts have averaged about 1.5M per month. 4. Current Assessment Bad Housing starts continue to be less than 800K per month. August 2012 were at a seasonally adjusted rate of 750K. That is up 30% since a year earlier. Building permits were at a seasonally adjusted rate of 803K, which is about 25% better than a year earlier. Privately-owned housing completions in August were at a seasonally adjusted annual rate of 689K, up 12% from a year earlier. 5. Future Assessment Fair Building permits and housing starts have been trending up, and should continue, going from Bad to Fair. 6. Risk Medium The housing recovery is still fragile. There is still a lot of inventory of foreclosed homes, undeveloped lots, as well as a lack of home buyers due to high unemployment.